A first-hand report on the bloody government repression that began in April. There is no end to the fighting between the government of the FSLN– the Sandinista Party–and the uprising that is trying to force it out of power. See my previous article about the government’s corruption and assaults on democratic rights. Over 300 people have died in the conflict so far. On July 24, a Brazilian medical student and three others were killed in Managua by government forces, according to the Daily Mail. Lately, the government has being organizing “Sandinista committees” in the neighborhoods, called “toads.” Their job is to denounce people who have participated in the anti-government demonstrations or in the barricades and dams built in the streets during the current uprising. Most of the victims of these denunciations are young people, who are then taken from their homes. Some have been arrested and others have been killed in front of their mothers–such was the case of my neighbor, a young man who participated in the dams. When they killed him, they told him that having participated in the battles is what killed him. In this fight, not only have people who do not belong to any party died, but also militants of the FSLN who have protested. But the government has only recognized as victims the soldiers who have been killed, some by the FSLN itself or by the homemade arms called “mortars” that the opposition is using in the uprising (these are small mortars used in celebrations at festivals in the countryside). Fighting is taking place all over Nicaragua. There is no city that has not seen battle, and there is no place where victims have not cried. The second week of July was the bloodiest so far, because the dictator (President Ortega) wanted to celebrate the anniversary of the Revolution of 1979 on July 19, without barricades in the streets. The army attacked the people on the barricades all over. The cities that have suffered the most are Masaya, Carazo and Chontales. There were many dams there. In Masaya, there is an indigenous community called Monimbó. They were never really favored by the revolution. They are mostly artisans and owners of footwear workshops, hammocks and handicrafts. Paramilitary forces and the National Army attacked Masaya in mid-July. President Ortega has his own army of paramilitaries, made up of well-trained people, who attacked Masaya. The paramilitaries wear hoods so as not to be recognized. Some people say they are from the national military, others that they are Cuban and Venezuelan. Still other attacks came from the snipers, who watch the marches and kill selectively. We are facing a government that kills its own people. Suddenly we live a nightmare in which the military is not to be trusted, and even less the government. The university students, both public and private, have come together with the goal to getting Ortega out of power. The university that has shown loyalty to the regime is the Autonomous University of Nicaragua, UNAN-MANAGUA, where I worked for more than 25 years. I knew the level of corruption with regard to the elections of the university authorities. The current authorities have been re-elected five times. They are militants of the FSLN, and are not elected for academic merit, but for loyalty to the party and to guarantee delivering the vote of the young students. Likewise, there is the organization of university students, whose leaders have remained in the university for more than 10 years, that is to say, in all that period they have not finished their university careers, in order to prevent other leaders from representing the university students. These leaders are approved by the state university authorities and receive salaries monthly, which come out of the money given to the university by the government, a huge 6 percent of the national budget. This organization does not have any function that serves the young people with economic problems, even though it could help them financially and could support student issues, as was done in the 1980s. Tourism has been affected everywhere. In Granada, the oldest and most touristic city, all the tourists left and won’t return in the face of so much insecurity. The National Police of Nicaragua, which always took care of the tourists and kept the thieves and gang members under control, is now an institution that protects only itself. My friend, who had a small hotel in Grenada, has had to close it. Nobody comes. The foreigners who had small businesses and offered the tourists nightlife also closed and went away. The majority had rented small spaces and offered liquors and food from their countries of origin and Nicaraguan food and drink. Now all this is gone. The Sandinista government has allowed people sympathetic to them to seize land in the countryside. An elite is taking productive land that was cultivated by its owners. This has been a practice of the Sandinistas, to allow seizures and to offer houses or properties that do not belong to them. 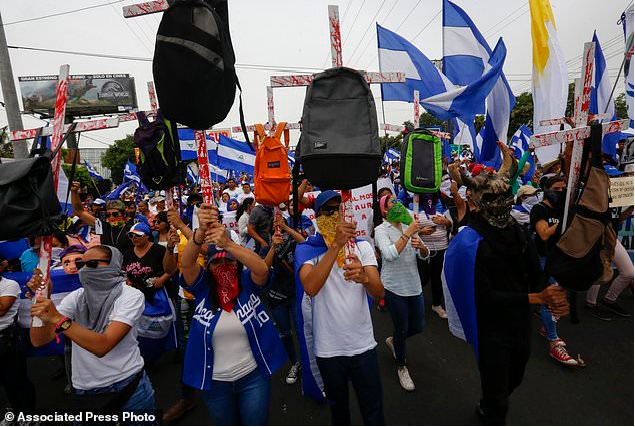 The first time the population protested in the streets, Ortega called for a dialogue to repair the problems that he considered to be his mistakes, but his forces had already killed some 70 students. A Civic Alliance was formed by leaders from different sectors, such as private companies, farmers, universities, and students. Nothing has come of it. Now, after months of fighting, Ortega still refuses to step down or even to schedule early elections. The government has carried out assaults, threats, torture, disappearances of people, and the creation of a military body loyal to the regime, on a daily basis. Nothing has been resolved, and the death toll is over 300. Ortega does not speak to the Nicaraguan people. He never grants an interview to the independent Nicaraguan press, and not even to the four television channels that his family manages. We heard the interview that Ortega just gave to Fox News. We figure he did that one because he wants to have the President of the USA listen to him. Both of them have problems with their oppositions. Throughout his presidency, Ortega has disappeared all his opposition. We heard that he used to kill them in different ways. His wife, Vice President Rosario Murillo, is not popular in Nicaraguan society. Even though she has many children, she does not show any respect for the mothers who are suffering from this fighting. The many mothers who have lost children deserve her compassion. This horrific situation demonstrates all too well how dictatorships are not the preserve of the right, but of any party across the political spectrum. The roots of the violence against students and workers must lie in the structures of Ortega’s government and, more significantly, the process by which he came to power. Where old societies are overthrown and new societies formed by leaders on behalf of people, fundamental problems blossom. How can a President claim to lead on behalf of a people when that president has a net worth of $50 million while 30% of the population live on less than $2/day, and 50% of those living in rural areas are in extreme poverty. I am shocked and dismayed by this betrayal of everything the Sandinista revolution stood for and partially achieved. As one of many inspired Europeans I went to Nicaragua in the late 1980s to learn from and support the educational and health measures being put in place by the new government. In the intervening years I have not kept up with developments in Nicaragua as I was disappointed when the Sandinista government lost power to Violeta Chamorra’s conservatives in the first (I think) freely held elections in 1990. I thought then that US influences would once again dominate through economic forces as opposed to its covert operations through the medium of the Contra rebels in the 1970/80s. In this case in the personality of Ortega. The Sandinista government was not without justified criticism in the 1980s over its treatment of some indigenous peoples in the north east of the country where I worked very briefly on a women’s empowerment programme. I will follow this situation..not via the DAILY MAIL!! but the ALJAZEERA news medium and your articles.